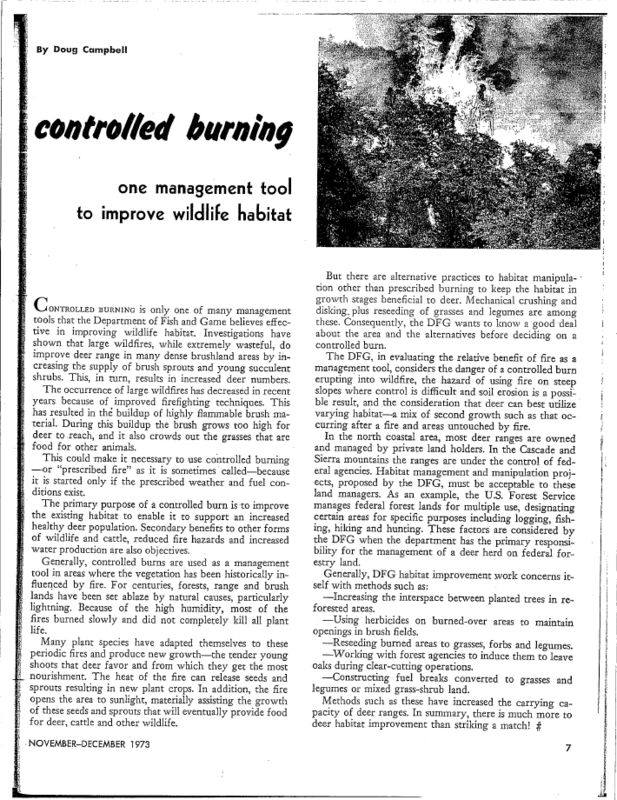 Today we feature an article that looks at how the Department of Fish & Game utilized controlled burns as a management tool. As the article states, fire has influenced plant and animal species for centuries. It is a common misconception that many animals are killed by fire. In fact the primary effect fire has on wildlife is habitat alteration. Some plant species have actually adapted to cope with fire. This article mentions pyriscence as an example. Pyriscence is when the maturation and release of seeds is fully or partially triggered by smoke and/or fire resulting in new plant crops. Managing habitat with fire also reduces fire risk by lowering the fuel load. Large fuel loads -dead plant material and brush build up- that are allowed to accumulate over time cause fires to burn hotter and spread more rapidly. These are the types of wildfires that are more likely to become dangerous and destructive to people and property. Using fire as a tool is still an important technique in managing habitat for various species of plants and animals today. This article originally appeared in the November-December issue of Outdoor California in 1973.